Jenn Burleton, now executive director of TransActive Education & Advocacy, performed at the Michigan Womyn’s Music Festival twice in the late ’80s and early ’90s. Photo by Mariette Pathy Allen. It’s been more than two decades since musician and trans activist Jenn Burleton performed on stage at the Michigan Womyn’s Music Festival, but the annual event still maintains its controversial ban on women like her. 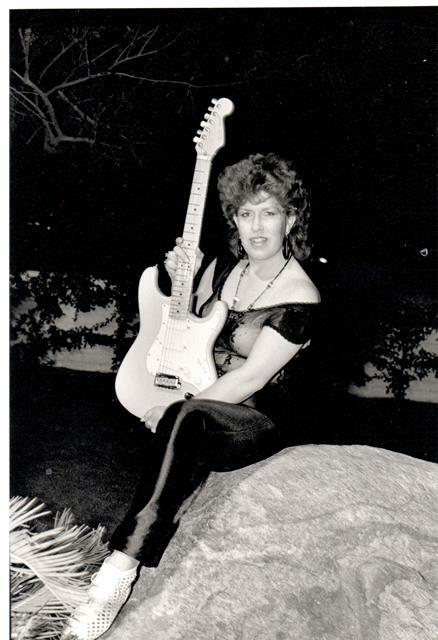 Though the executive director of TransActive Education & Advocacy is publicly out about her trans identity today, she wasn’t when she played guitar for the thousands of women gathered on “the land” in the late ‘80s and early ‘90s. The musicians she played with have continued to perform the fest, as recently as 2013, though at least one has announced they won’t return next year. A number of performers have either pulled out of the 2013 lineup or declined to return in response to a Change.org petition created by trans activist Red Durkin opposing the trans-exclusive admission policy. Burleton shared her unique perspective with PQ Monthly as a trans woman who experienced MichFest both under the radar and in the spotlight. PQ Monthly: What are your thoughts on MichFest’s “women-born-women” admission policy? Jenn Burleton: Having performed at MichFest I think it’s deplorable. I was a pro musician for many years and twice performed there with artists I’d rather not mention. I played guitar in their band. PQ: Did the musicians you were performing with know you were trans? PQ: Were you aware of the festival’s “women-born-women” admission policy when you played there? Burleton: Yes. More so in the ‘90s. I was VERY conflicted about it. I remember not being a very happy camper on stage at the time. But I wasn’t out at all professionally then. It just seemed pointless and driven by ignorance and blind hatred of anything remotely connected to oppressive misogyny. Music is NOT intended to tear people apart. Wrong place, wrong time for that crap. PQ: Aside from the policy, did you notice any anti-trans sentiment while you were in the space? Burleton: From the musicians, mostly not. From a small (but very vocal) percentage of people attending, yes. I just call it the radical lesbian feminist “Fred Phelps Brigade.” It’s the same mindset as the Cathy Brennans and Gallus Mags of the world: hate and ignorance disguised as socio-political opinion. PQ: What do you think is the best way to approach MichFest? A number of musicians who claim to be allies to trans women say they are creating change from within. Do you buy it? Burleton: I don’t buy it. Look, to paraphrase [Artists United Against Apartheid] from the ‘80s: “I Ain’t Gonna Play Sun City.” The way you make change at Michfest is by saying, “OK, you want to have a music festival for women, but YOU want to be able to decide who is woman enough for your festival, fine. But you’re not going to get top-tier talent anymore.…” Anything other than that is just caving in to the most radicalized and misinformed voices. The Indigo Girls did the right thing by announcing they wouldn’t play there anymore. I wish they’d done it sooner, but hey, they did it. PQ: What do you think draws “top-tier” talent to the festival? I went because the band I was playing with was booked there and I wanted to have the experience of playing before an amazing audience of thousands of women. But for me, I didn’t really care too much whether they all had vaginas (natural or surgically constructed). PQ: So do you support the boycott? PQ: Would you stop supporting a musician who performed there? Burleton: Probably, yes, assuming they didn’t go there and take the opportunity to make some kind of statement opposing the policy. I mean, I stopped going to Mel Gibson movies. Seems consistent to me. Burleton: Well, it’s certainly more nuanced than a simple “yes/no.” Look, if I wasn’t “out” and went to MichFest after being booked as a female artist and while there, I said, “Glad you all enjoyed my music. I’m a transwoman, and the organizers of this event need to get their heads out of their asses,” I would hope that my fans would continue to support me. In general though, if an artist says, “Hey, I don’t agree with the policy, but I’m going to play there anyway,” then yeah, I’m going to stop supporting them. PQ: Would you play there again if you thought no one would be the wiser? Or if they changed the policy? Burleton: Oh, HELL NO to the first part of that question and yes to the second part of the question. I still beat myself up for not saying something years ago when I played there. Honestly, it was NOT one of my prouder moments in life. For more on the MichFest debate, see “In and out: Defining membership and identity within LGBTQ spaces” here.